In this blog we have solved similar problems before, but this is one that can be easily solved by hand. We only need to be careful not to confuse our knowledge state with the one of Albert & Bernard. Albert and Bernard just became friends with Cheryl, and they want to know when her birthday is. Cheryl gives them a list of 10 possible dates. 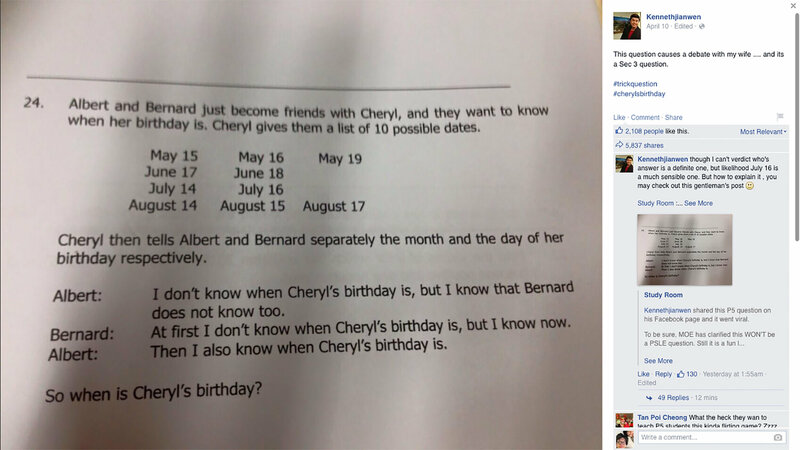 Cheryl then tells Albert and Bernard separately the month and the day of her birthday, respectively. Albert: I don’t know when Cheryl’s birthday is, but I know that Bernard does not know, too. Bernard can do the same deductions we have and eliminate the options that are not possible from his state of knowledge (all the options with months different from July and August). Bernard: At first, I didn’t know when Cheryl’s birthday is, but I know now. Albert: Then I also know when Cheryl’s birthday is. Print the number of integers below one million whose decimal digits sum to 42. A more interesting problem is to try to write the smallest C program that solves the problem, where C program is defined as something that can be compiled & executed by Ideone in “C” mode. I know it can be done in 83 bytes, but can it be done using less?